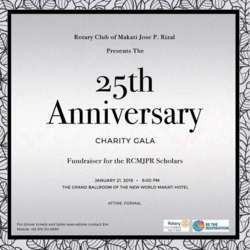 Rotary Club of Makati J.P. Rizal is celebrating it's 25th Anniversary - CHARITY GALA at The Grand Ballroom of New World Hotel Makati. pls see invitation) this 21 January Protected content . Protected content I ask for your support on this.and you might like to take the opportunity to be one of our Sponsors to promote your business to the Makati, Manila, BGC and surrounding areas. 1 scholar a month supplemental allowance. 1 table of Protected content support a child for 1 year. Protected content . Dinner - enjoy a delightful songs with an opera singer and Broadway songs from one of our Internations member while having your dinner. Protected content . Opportunity to participate at Silent auction. Please Note Payment Of Ticket. Much appreciated if you deposit your payment - below have to have the number of definite attendees for catering and seating. If you cannot get to the bank or do an online deposit message me you would pay @ the venue on Protected content . Pls note also that If in any case you won't be able to attend for any reason you still have to pay. THIS IS A CHARITY initiative.. Thank you:-)Thank you so much for your support. Pls bring your friends and client. This year marks a milestone year for us as we turn twenty-five years in service. To celebrate this occasion, we will hold our 25th Anniversary Celebration on January 21, Protected content the New World Hotel in Makati City. Last year, our club, Rotary Club of Makati Jose P. Rizal, was awarded a global grant by The Rotary Foundation (TRF) for the purchase of a human breast milk pasteurizer that will benefit thousands of nursing mothers at the Philippine General Hospital. In Protected content , we were awarded another grant by the TRF, for the construction of toilet blocks for the St. Francis Learning Center and Aeta community in Nibangon, Mangan-Vaca, Subic, Zambales. As a multi-decorated club of Rotary International District Protected content , we have been awarded and entrusted with such global grants because of our track record in effectively mobilizing resources and swiftly taking action to address the country’s biggest and most pressing problems. Much may have been accomplished, but there is plenty of work left to be done. We need your help by donating to our club to make our efforts go even further. In this regard, please find enclosed our sponsorship packages and the rate card for our anniversary event. We are expecting at least five hundred Protected content . As such, we will be printing Protected content copies and distribute these to our guest VIPs, some of which are distinguished business men and public figures. We look forward to your generous support to this event. If you would like to learn more about the above mentioned service projects or the rest of the projects we undertake, we’d be glad to discuss with you in detail the impact of your donation. interested to Sponsor please call or message me on Protected content message me on messenger for more info and rate.